V.com weekend vote: How much liberty should a soloist take in a well-known piece? September 29, 2017, 10:50 AM · How much is too much, when it comes to a soloist putting his or her personal stamp on a well-known favorite? This question came to me this week as I read the wildly differing yet passionate opinions inspired by a series of performances by Anne-Sophie Mutter with the Chicago Symphony. Mutter performed Mozart Concerto No. 5 for the orchestra's Gala Concert last Friday, followed the next night by the Tchaikovsky Violin Concerto for its opening subscription series. While everyone acknowledged her technical skill and incredible presence as a performer, opinions ranged greatly over how much personal touch was there, and whether it was too little or too much. When it came to the Tchaikovsky, Sun-Times critic Kyle MacMillan found it "comfortably elegant" and wished for more "sparks of spontaneity" -- while Michael Cameron at the Chicago Classical Review called her approach "free-wheeling" and said that "her refusal to submit to a predictable interpretive routine was as bracing as it was unsettling." For John von Rhein at the Chicago Tribune, her Mozart 5 interpretation was so "overlaid with romanticized touches" that it "crossed the line from expressive refinement to mannerism." We like to think that we are open to an artist who "thinks outside the box," especially someone whose artistry we have trusted for many years, but are we? Speaking for myself, I have to say that sometimes I am, sometimes I'm not. For example, how about this notorious Mozart 3 cadenza by French violinist Gilles Apap, which pretty obviously leaves the classical genre and enters into whistling, country fiddle, jazz etc. Thrilling! Completely inappropriate! Which is it? To start the conversation, I wanted so see what people generally think about taking liberties in music such as the popular violin concertos, which are both well-known, frequently recorded and performed, and composed in detail. Is the highest aim to convey the composer's wishes? Or is it more interesting when the performer is expressing something through those ideas and finding their own take on them? Or is the score just a starting point? Please also add your thoughts and experiences in the comments below! Discussion: A Shocking Cadenza, What Would Mozart Think? September 29, 2017 at 06:41 PM · I believe that as a performer, we must follow all of the composer's markings, indications and intentions. With this in mind, we can make personal adjustments as we like, keeping in mind all of the composer's ideas. You can do anything you want with cadenzas. There are teachers who give you a few choices for interpretations, and sometimes they'll take your own interpretation if you really convince them. September 29, 2017 at 06:49 PM · Take liberties within the style, but also the cadenza should be your own. I've always considered written cadenzas to be a (very strong) suggestion, but the performer should be able to create their own. September 29, 2017 at 07:05 PM · I have always been told that my interpretations are very unusual and "out there", even without making an effort to go in this direction. When I have tried actively to be more creative, which has usually included excessive ornamentation, lots of freedom with rhythm, and redistribution of chords, this has gotten even more backlash. I have never come across a teacher who is willing to have a decent dialogue about interpretation. Teachers I have studied with usually just dictate how they think it should go, according to what they think the composer intended, line by line. If I was lucky, I was given a few options to choose from in any given phrase. In masterclasses, I always got the impression that the teacher just wanted to show off. I think that one reason that classical music is falling in popularity is the lack of innovation. We focus much more on re-creation than creation, by not only trying to narrow acceptable interpretations, but designating works by living composers as inherently beneath the old "masterpieces". Recording has made this worse, as teachers can now say, "go listen to Heifetz and try to sound as much like him as you can". I also feel that many classical musicians are overtrained. I think we can only sound like the best versions of ourselves. There is a reason Mona Lisa postcards don't cost as much as the real thing. September 29, 2017 at 07:43 PM · I am for the soloist and the orchestra to take liberties with the score. For instance, the soloist may want to add a cadenza to the Bruch violin concerto or a conductor may want the harpist to accompany the violin during the Andante of Mendelsohn's violin concerto. I think occasional additions sound fresh and engaging. September 29, 2017 at 08:24 PM · In my opinion, the legendary Ivry Gitlis might be an upper limit for liberty taking - especially as he got older. September 29, 2017 at 08:35 PM · Like any performer, you will never please everyone. I agree with Lieschen, Classical music has a reputation for being boring and always sounding the same. Yes, some customers refuse to accept any changes but change is what the world is about. The real proof is what happens to the ticket sales for ASM after the reviews have been published. If she got more interest (ticket sales) from the non-grey-haired set that is positive for all of us. September 29, 2017 at 08:56 PM · Isn't that why we enjoy listening to different soloist playing the same concerto, to see, hear and feel how they see the piece? I am all for individual interpretation. With that must come the acknowledgement that not everyone has to like every interpretation. But criticizing an interpretation as being not what the composer had in mind would suggest that we really know what the composer wanted. And that can never be the case if the composer is not alive anymore. The score gives us an idea but it will never really tell us what the composer would have liked to hear. September 29, 2017 at 09:06 PM · I think any of the great composers would have wanted us to take chances. Thats what they did. Beethoven on a five string viola for example. September 29, 2017 at 09:07 PM · I am always partial to the artists who add their own personal style and vision to the score, particularly in works that I have heard countless times such as the Tchaik Concerto. That is why they call us artists -- it's to do something unique, not to play the same way as everybody else. Artists who I love, who never fail to surprise and delight me are Ivry Gitlis, Anne Sophie Mutter, Patricia Kopachinskaja, Janine Jansen, and yes Gilles Apap. Check out some of his other offerings besides the famous or infamous Mozart Cadenza. September 29, 2017 at 10:10 PM · I am reminded of the never-ending debate beteeen those who see our constitution as a living document and those who are "originalists" and see the document as frozen in the 18th century. I am with those who believe that every generation has the duty to reinterpret. September 30, 2017 at 12:01 AM · When you have a concerto which the composer has had to alter to fit in with the requirements of its first performer, e.g. What Tchaik had to do with Brodsky after Auer had rejected his first version, you have the situation where the composer is already known to be getting other than what he originally wanted. In such a case, a few liberties by the performer might even bring the work CLOSER to what the composer intended. 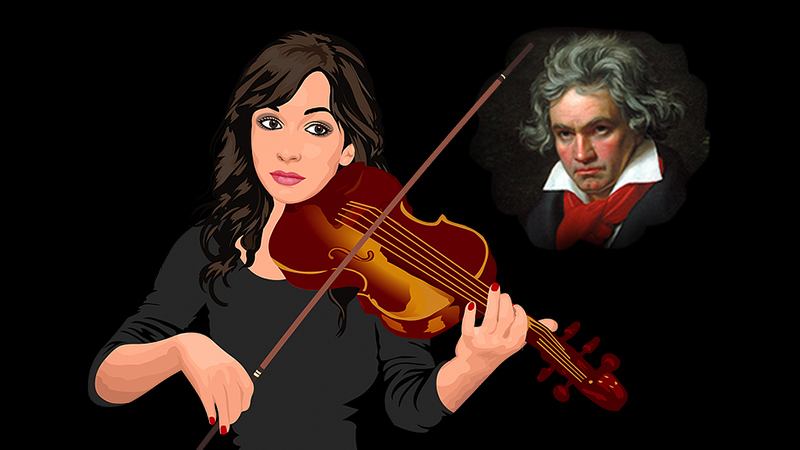 September 30, 2017 at 07:49 AM · Just watch how Patricia Kopachinskaja worked with the orchestra when she played the first movement of Beethoven's violin concerto in D on YouTube and youo'll understand the point of this argument. September 30, 2017 at 02:11 PM · Why is it so common in theatre to reinterpret pieces or totally change the setting to modern times and on the other hand so controversial in classical music? September 30, 2017 at 06:46 PM · Doesn't the Schnittke cadenza to the Brahms Vln concerto hearken with themes from the Beethoven concerto....I believe Kremer uses this anti-chronologic gem...What's the opinion on this stunt ?? October 1, 2017 at 02:40 PM · Don't deliberately contradict a composer's instructions. If you're not happy with them, write your own piece. October 1, 2017 at 03:05 PM · An earlier comment prompted me to have a look at the Kopachinskaja interpretation of the Beethoven on YouTube. It is highly original and wonderful. For example she appears to play entire passages in harmonics, but I think it is really her way of bowing that makes it sound like that. October 1, 2017 at 09:57 PM · A lot of the comments on Kopachinskaja videos on YouTube are simply infuriating. Why should anyone play if they don't find something new to say? And no, Beethoven shouldn't get to be some kind of precious, sacred exception. I haven't witnessed this level of rigidity of expectations from audiences in any other music genre. October 2, 2017 at 01:28 AM · I think there's probably a difference between playing classical and playing crossover (which may potentially include pops concerts also). A player like David Garrett can take significant liberties with classical works when he plays crossover concerts, because our expectations are different. October 2, 2017 at 05:22 AM · Generally speaking, I believe that the answer should be entirely left to each soloist. Soloists should have the freedom to choose one way or the other, as it is purely an artistic decision for the soloist to make in each performance. It'll be indeed sad to see a soloist has to conform to one approach or the other, or listen to other people's views with respect to how she/he should interpret a piece in each occasion. October 2, 2017 at 05:39 PM · Lydia, you make a good point: context is very important. A stadium concert, or a chamber concert, or a church service? It makes a difference, with what changes an artist, and audience, may feel are merited. October 3, 2017 at 05:50 PM · I'm definitely in the freedom of interpretation camp. We can hear dozens of superb recordings of Beethoven, each with their own minor tweaks - but how often do you hear something truly unique, such as Brooklyn Rider's astonishing interpretation of Beethoven's Op. 131 quartet? Why not experiment wildly, and be creative? If someone doesn't like it, they don't have to listen - but I think the inherent creativity of music should always be encouraged.